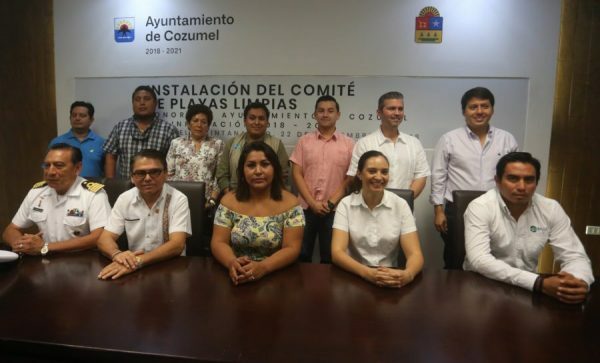 With the purpose of conserving the ecosystems and specifically the coral reefs that are in the most important natural resources of the whole region, the City council of Cozumel, carried out in the installation of the Clean Beaches Committee; which will be coordinated by Sandra Dutton Ruiz, Deputy Director of Ecology, who will work in work tables, activities and actions in conjunction with public institutions, civil society organizations, businesses and citizens in general, to protect and preserve the coasts and reefs of the island of Cozumel. During the meeting, Karen Cruz, president of the Commission of Tourism and Ecology of this municipality, told Municipal President, Pedro Joaquín, that it is important to promote a sustainable tourism, that pushes social harmony and improvement in the quality of life of citizens, based on an adequate use of natural resources, as indicated in the work plan “Axis II: Cozumel Natural“. Cruz also explained that coastal ecosystems are important for the economic development of the destination and welfare for the population; she pointed out that these areas, at present, are a priority. “We are a privileged municipality, we have the largest coral reef system in America, which forces us to preserve our natural wealth, with actions as a whole: society, government and business sector” emphasized Dutton Ruiz. The Clean Beaches Committee is composed by Pedro Joaquín, municipal president of Cozumel; director of ecology, Sandra Dutton Ruiz, as technical secretary; director of income, Francisco Baeza Villanueva, as treasurer; The Head of Programs against Marine Pollution of the Naval Sector, Ausencio Gómez Maya, federal member; Director of the Conservation Center of the FPMC, Rafael Chacón Díaz, as state government representative; Director of the Federal Maritime Terrestrial Zone (Zofemat), Ricardo Lizama Escalante; president of the Association of Hotels of Cozumel (AHC), Ulises Guzmán Peregrina, as social representative and the president of the Center for Social and Environmental Studies, Alex Fernando Contreras Fiscal.